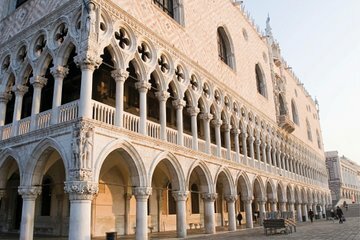 With so many things to see and do in Venice and the area, this tour allowed us to plan our day, knowing when it would start and an approximate time it would finish. We met in the square, under the clock tower, where other tour groups were assembling. We checked in and waited to walk over to the palace. One tour group was ahead of us going through security and we quickly were in the palace. The tour was a good overview, our guide was excellent and we saw everything we needed to see. Be prepared, in the summer months it can be very hot in there, so some may want to bring a small fan. Overall, this is a great tour for the cost and time. Le rendez-vous sous l'horloge est un peu chaotique. Peut-être qu'il serait bien de revoir l'organisation du point de rencontre. Sinon, la visite guidée s'est bien déroulée. C'est intéressant d'avoir un complément d'information tout au long du parcours. La guide connaît bien son sujet. Par contre, elle semblait blasée. Somme toute, j'ai bien aimé cette visite guidée! Excellent organisation, radio headphones a boon and a very well informed and interesting guide. I really enjoyed this tour. Heather knew her history and was an interesting and funny storyteller. I cannot stress enough that you should go on guided tours as opposed to just wandering around looking at places. Highly recommend! This tour was very good with a knowledgeable guide. It certainly is an amazing building ... steeped in history. Would definitely recommend. We arrived in Venice and jumped right into this tour with Marco! He was a fabulous tour guide. He was knowledgeable and hilarious. We went 4 months ago now and I can still hear his voice in my head so that means it was memorable. The Doge's Palace is beautiful. I had been to Venice before and skipped this tour. I was glad to do it this time. It is however very busy to navigate around other groups, Marco did a great job of this. Very good guide lots of information, the rooms are unbelievable. Enjoyed looking at the prison and the bridge of sighs.